I first tasted this sumptuous rice dish in Umbria. Its simplicity and gentle richness are wonderful, and I particularly love the speed at which the ingredients are assembled and served. Put the rice in a large saucepan with twice its volume of salted water and bring to the boil. Turn down the heat and simmer for 10 minutes until just cooked. Drain well in a sieve and put half of it into a heated serving bowl. Stir in the cheeses, herbs and butter and season with pepper. Cover with the remaining rice and leave to settle for 1 minute, allowing the herbs to wilt and the cheese to melt. Toss together vigorously with two large forks until the cheese starts to go stringy. Serve immediately on warm plates. 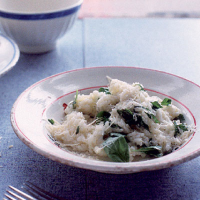 Serve extra Parmesan at the table if you wish. The Corker recommends- A Montepulciano-Sangiovese blend is a real success: dark and enticing, with the vivid acidity this dish needs.